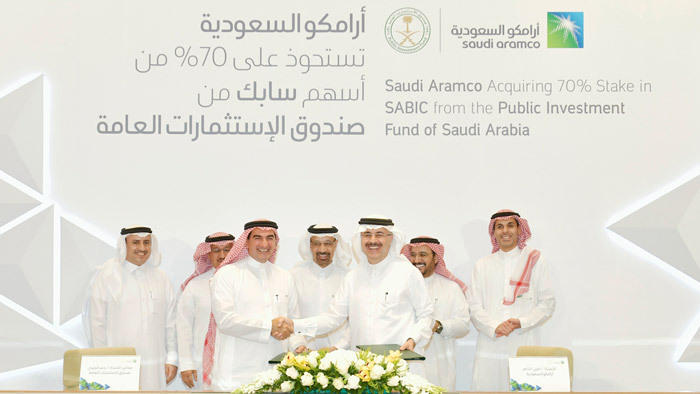 Saudi Aramco has signed a share purchase agreement to acquire a 70% majority stake in Saudi Basic Industries Corporation (SABIC) from the Public Investment Fund of Saudi Arabia, in a private transaction valued at SAR 259.125 billion (USD USD69.1 billion) or SAR 123.39 (USD32.9) per share. The remaining 30% publicly traded shares in SABIC are not part of the transaction, and Saudi Aramco has no plans to acquire these remaining shares. The transaction is subject to certain closing conditions, including regulatory approvals. Headquartered in Riyadh, Saudi Arabia, SABIC has global operations in more than 50 countries with 34,000 employees. In 2018, SABIC’s consolidated production volume across its various business units was 75 million metric tons, and recorded net income of USD5.7 billion, annual sales of USD45 billion, and total assets of USD85 billion. “This is a win-win-win transaction and a transformational deal for three of Saudi Arabia’s most important economic entities. It will unlock significant capital for PIF’s continued long-term investment strategy, underpinning sectoral and revenue diversification for Saudi Arabia. Furthermore, it will introduce a strategic owner that can add considerable value to SABIC and all its shareholders, while capitalizing on SABIC’s strong capabilities to unlock the opportunities for growth that Saudi Aramco, a key player in energy markets around the world, can offer,” said H.E. Yasir Othman Al-Rumayyan, managing director, Public Investment Fund of Saudi Arabia. “This transaction is a major step in accelerating Saudi Aramco’s transformative downstream growth strategy of integrated refining and petrochemicals. SABIC is a world-class company with an outstanding workforce and chemicals capabilities. As part of the Saudi Aramco family of companies, together we will create a stronger, more robust business to enhance competitiveness and help meet rising demand for energy and chemicals products needed by our customers around the world,” said Amin Nasser, president and CEO, Saudi Aramco. Abdulaziz Al-Judaimi, Saudi Aramco’s senior vice president of Downstream, added that Saudi Aramco is pursuing partnerships and acquisitions “where we create long-term value, and developing groundbreaking crude-oil-to-chemicals technologies” and that SABIC is a good strategic fit. He said that SABIC is a solid platform to support Aramco’s continued investment for future growth in petrochemicals, the fastest growing sector of oil demand. The acquisition is in line with Saudi Aramco’s long-term strategy to drive growth through an enhanced downstream portfolio by increasing global participated refining capacity from 4.9 million to 8-10 million barrels per day (bpd) by 2030, of which 2-3 million bpd will be converted into petrochemical products. This downstream portfolio will consume significant quantities of Arabian crude oil.